Swap spreads are excellent leading indicators of systemic risk, and thus very important things to track, which is why I continue to update this chart from time to time. As the chart suggests, conditions in the U.S. are just about optimal from a systemic risk standpoint: there is no shortage of money, default risk is low, and bank/counterparty risk is minimal. 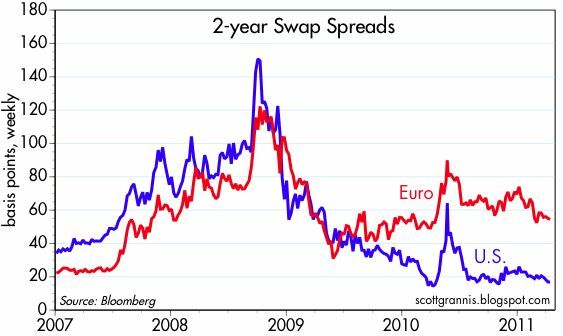 Conditions in Europe are still a bit unsettled, but they are slowly improving; the market continues to worry about sovereign debt default risk and its possible spillover effects, but swap spreads are saying that this risk is manageable and unlikely to prove seriously contagious. Good news. I just hope there is not a Long-Term Capital Management event torpedo out there somewhere.